Everyone knows its Swords & Wizardry Appreciation Day, right? Alright, here's two chances to get some swag, either cheaper than cheap for awesome loot or free for "eh, it's okay" loot. 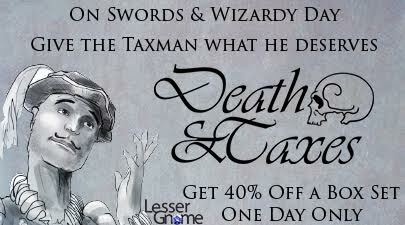 Now, the Lesser Gnome, or someone that looks mightily like him, is offering 40% off the Death & Taxes Boxed set for one day only, April 17, 2016. There's a catch though. You only have a limited time to grab the sale price... as in 1d4+1 opportunities before it's all gone. How do you score a chance to grab one of these boxes a 40% off the retail price? Well, you need to join the Tenkar's Tavern Facebook Community and use the code offered therein. As stated above, there are only a limited number of uses for the code, and it expires at midnight, Sunday, April 17th. In some timezone west of the east. So, what else is up for grabs? Add a comment to this very post and one random commenter will be made a Patron of The Tavern for the month of April. Anything I send to my patrons that back me at Patreon for the month of April will also be sent to you in PDF and Print. So far one 1 page 4 sheet Creature Sheet for Swords & Wizardry / White Star has been sent out via PDF and there should be at least one more coming. Wow. I was fortunate enough to pick up D&T at Garycon, but the rest of you, jump on this right now. I always enjoy these special events and giveaways! Thanks! Comment! I will even join Facebook (gasp!) in order to score such a sweet deelio! Plus, it's my birthday! Woo! 42 years old today. Takes the sting out of Tax Day! I like box sets. I like discount codes. Win! Joined the FB group...but, still pending. Hope to get before all the sets are gone. Very cool. Wish I had time to put something decent together for the Appreciation Day. Happy S&W appreciation day! Enjoy D&T. Holy potatoes! I just scored the D&T collector's box set for $60 because of you!! Thanks Erik!